On September 22, CROP volunteers joined other volunteers in Grove Park and along the route to support AIDS Walk Delaware. 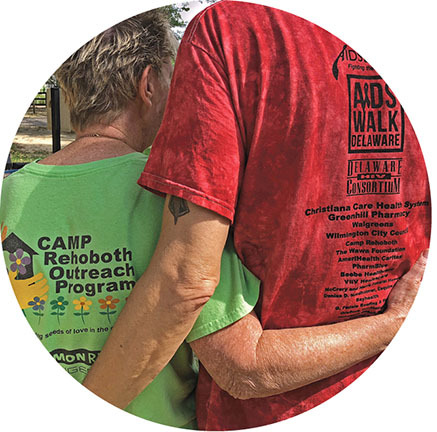 Over $4,000 was raised for the fight against AIDS by CAMP Rehoboth’s Rainbow Unicorn Team. Thank you, teams!! It is a great time to be outdoors. CROP returns to the Delaware Botanic Gardens in Dagsboro. Help DBG keep the momentum going as they grow and become a world-class, inspirational, educational, and sustainable public botanic garden in southern Delaware. As an option, volunteers can bring a brown-bag lunch and have a tour of the gardens and woodland afterwards. A highlight of the Fall season is the Rehoboth Beach Film Festival and CROP is there to help. Volunteers will assist with ticket taking and more. There will be several shifts throughout the day. Tuesday, November 13 from 1 to 4 p.m. CROP has a team traveling to the Food Bank of Delaware in Milford to help make sure families in need enjoy the bounty of the season. Volunteers will sort and pack a multitude of food items for distribution throughout the state just in time for Thanksgiving. This project is FULL, but there is a wait list. Debbie is an active volunteer with CAMP Rehoboth and also serves on the Membership Committee. She’s lived full time in Rehoboth since 2009, when she retired after a long career in the Federal Government. Do you know AARP? The many things the organization does for its membership might come as a surprise. To learn more—AARP has teamed up with CAMP Rehoboth for an introductory meeting on Friday, October 26, 5:30-7:30 at the Community Center. CAMP Rehoboth and AARP invite the public to join in an early evening event with refreshments and hors d’oeuvres, to hear about expanding the possibilities in life at any age through AARP. The Delaware Shakespeare Community Tour will present a FREE performance of Shakespeare’s The Merchant of Venice on November 3 at the CAMP Rehoboth Community Center. This professional acting company will present Shakespeare’s masterwork, a play focusing on discrimination and marginalized communities, which is as relevant today as when it was written in the 1590s. 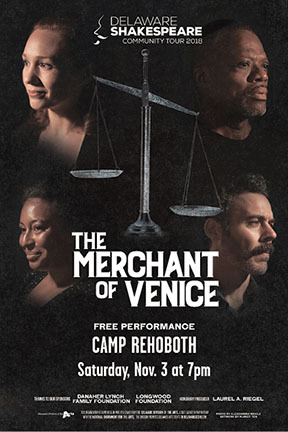 While The Merchant of Venice is a story that focuses on the specific injustice of anti-Semitism, the company seeks to broaden the conversation, looking at root causes and similarities for other marginalized groups. To celebrate the 10th Anniversary of the CAMP Rehoboth Chorus, a special concert called Seasons of Love is planned for February at Epworth United Methodist Church in Rehoboth. Hosted by Liane Hansen of NPR’s Weekend Special Edition, the show dates are February 15 and 16 (Friday and Saturday evenings) and February 17 (Sunday matinee). October 19, 2018 - CAMP Cheers!